The festival will process advanced orders starting with box 66 this year. They'll continue with box 67, 68, and so on until they reach box 75. Once box 75 is done, they'll circle back around to box 1 and continue processing from there. My picks ended up in boxes 21 and 49. I figure I'll have a fairly good chance with the picks in #21, but #49 might be a little iffy. Last year I received an e-mail confirmation of my order around 1:45 PM on Sunday, and I was in the latter half of the boxes to be processed. My friend dropped the other half of our collective picks off at the box office at 10:00 AM this morning. At that point, the staff were filling boxes 47 to 50 in parallel, and we ended up in box 49. Interestingly, last year there were 40 boxes in total. The boxes didn't look any different, and theoretically there should be fewer order forms because of a change in the process, so I wonder if that means even more people are using the advanced ticketing this year. My preliminary film list is below. We'll see by Monday which films I managed to get. Just a reminder, all advance order books must be submitted by 1:00 PM this Friday, August 31, in order to be eligible for the advanced order process. If you fail to submit your package by this time, your order will be processed after everyone who did make the deadline. 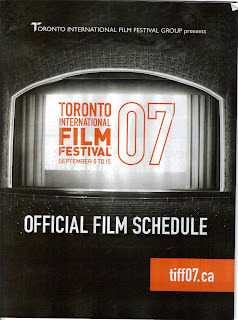 Buy a VISA Screening Room or Gala ticket at the Festival Box Office (444 Yonge St), online (http://www.tiff07.ca/), or by phone at 416-968-FILM or 1-877-968-FILM. As of September 5 at 7:00 AM, buy tickets for any film at any box office, online, or by phone. Expect slow response on the website and long lines at the box offices on this day. I dropped my form off at the festival box office at 1:00 PM today (August 30), and I was in box 21. They were also filling box 20 at the same time. There was a line to drop off the forms; it took around 10 minutes or so to get through the line. Expect the wait to be longer on Friday, when the majority of people drop their forms off. Sounds like there was a big screw-up with the out-of-town packages this year, and that hundreds were held up in customs in Newark today because they were missing manifests. Not sure where the problem was this year (although some reports seem to indicate it could have originated because of insufficent addressing info by the festival). Other people have reported problems with packages clearing customs in previous years, but it sounds like the problem might have been bigger this year. Some people are reporting that they're getting delivery promised by Thursday, although I'm sure many will only believe it when they see it. Check out the comments to this post at the Midnight Screenings blog to see how other people are doing with their packages. How the Heck do I Fill Out the Order Form (2007 edition)? Next, find a film around the same time that will be your backup choice if your first choice is already full when they get around to processing your order form. Note this step is optional. If you do not specify a backup film and your first choice is full, you will receive a ticket voucher which you can redeem at a later date for another film at the festival. Repeat this process until you run out of coupons or choices. For example, if you ordered a 10-film package, and you wanted 2 tickets for each film, you would select 5 1st choice films and optionally, 5 2nd choice backups. 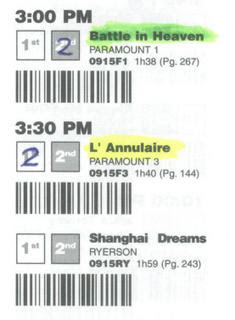 If your second choice for a film is not close to the first choice, or it is not obvious what or where the second choice is, feel free to write a note or draw an arrow, but don't write over any of the barcodes, and don't make things difficult for the festival staff by making it complicated. If you purchased 10-film packages or the Festival pass, you can select any film except for the galas at Roy Thomson Hall. 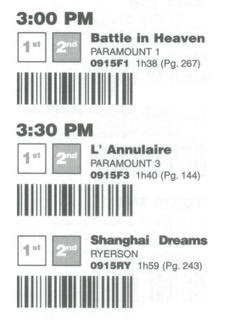 If you purchased a daytime pass, you can select any film that starts before 5:01 PM except for the galas at Roy Thomson Hall. For a 10-film package, you can select a maximum of 10 tickets for a single film. For a Festival or Daytime pass, you can select a maximum of one ticket for a single film (i.e. you can't get a ticket for you and a friend for the same film using a pass). Unlike in previous years, you can place all your choices in a single Advance Order Book, regardless of how many passes or packages you bought. If you bought 3 10-film packages, then all 30 1st choices and all 30 2nd choices can go in the same book. 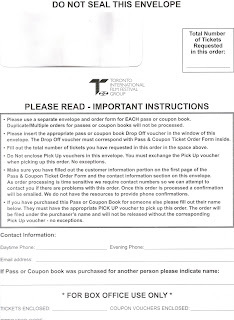 Once you have finished picking your films and filling out the order forms, ensure you fill out the "Ticket Order Form" information at the bottom of page 3 of the Advance Order Book. Fill out the contact information on the envelope. If you include an e-mail address, then the festival should notify you by e-mail which of your choices were filled and which were not when they have finished processing your order. If you bought the pass or 10-film package for someone else, ensure their name is also included on the form in the spot provided. Take the Drop Off Voucher that you should have received in the mail a while ago and place it in the envelope window. Do NOT include the Pick Up Voucher; you need to keep that to pick up your completed order starting September 3 at 10:00 AM. If you have a festival or daytime pass, then you will submit one envelope per pass. 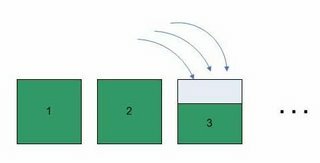 If you bought multiple 10-film packages under your name in one order/transaction, then you will submit one envelope for all the packages. This is different from how the process worked in previous years. Basically, you should have one envelope per Drop Off Voucher that you have. Drop off the envelope at the Festival Box Office at College Park before 1:00 PM on Friday, August 31 (that's this Friday!). Note this is the only box office that will accept these forms. If you do not turn in your envelope by 1:00 PM on Friday, then you will miss the lottery, and your form will be processed after everyone else's. You can pick up your completed orders starting 10:00 AM on Monday, September 3. If you receive an e-mail from the festival saying you got all your choices, then I would recommend that you do NOT show up first thing in the morning, as there will be long wait. If you didn't receive all your picks, then you should line up in the morning, as you will receive ticket vouchers in place of your missed picks. You can then move to another line to immediately use those vouchers to pick other films that are still available; alternatively, you can wait to use those vouchers during the festival, but there's no advantage to doing that. The Midnight Screenings blog has a link to Variety's list of which movies at this year's festival are international or North American premieres. The blog also has some good articles on how to schedule your films, as well as a breakdown of the number of seats in each festival theatre. The latter could prove useful if you're trying to gauge how many tickets might be available for a given film. 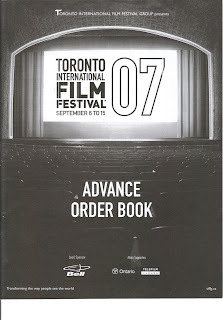 If you bought a festival pass, a daytime pass, or one or more 10-film packages, then starting Tuesday, August 28 at 9:00 AM you can pick up your Advanced Order Book, the festival schedule, and the programme book (if you bought one). These can be picked up at the Festival Box Office at College Park, 444 Yonge Street (at Yonge and College), south entrance, market level. The Festival Box Office is open from 9:00 AM to 7:00 PM for August 28 to 31. As mentioned in an earlier post, you don't have to show up right at 9:00 AM, as there is no advantage to getting your picks in first; the festival operates on a lottery system rather than first-come-first-served. Note you must go the Festival Box Office to pick up your order book; you *cannot* go to any of the other box offices. Be sure to bring along the vouchers that you should have already received in the mail. You will need an Envelope Voucher to get your Advanced Order Book, and optionally a 2007 Programme Book Pick Up Voucher for the programme book if you bought one (note that you don't need one to complete the ordering process). The vouchers should be labelled clearly enough, but if you can't figure out which one to use, bring them all and the festival staff will take the appropriate ones from you. Don't forget to also pick up the free festival schedule. You will need this to figure out when each movie is playing. Your completed Advanced Order Book must be returned before Friday, August 31 at 1:00 PM. If you turn it in after that time, you will not be included in the advanced ticket lottery. The tickets we made available for public sales comes out of a separate inventory - it doesn't affect pass and ticket package holders.... but your access to these tickets will still be determined by both your position in the lottery for the advance order procedure and the demand on said tickets. You may select any screenings except for anything playing at Roy Thomson Hall. So the festival does reserve separate blocks of tickets for individual sales and for advanced ticketing. So if you have a festival pass, a daytime pass, or a 10-film package, you can still select VISA Screening Room films or the showings of gala films that are *not* at Roy Thomson Hall in the advanced ticketing process. Thanks to the festival for their extremely quick reply to this question (someone was actually checking e-mail on Sunday night!). * Updated Sunday, September 2 at 11:40 AM. Some of the VISA Screening Room films and some of the galas still have individual tickets left. Check back on the website or at the box office periodically. The festival will occasionally release extra blocks of tickets, especially on the day of the showing. If you have a 10-film book, a Festival Pass, or a Daytime Pass, you will still be able to select VISA Screening Room films and the second showing of gala films, even if the individual tickets are sold out on the website. Each gala has two showings; the first is in the evening at Roy Thomson Hall. The second showing is in one of the other theatres on a subsequent day. You can't use your 10-film book or pass to get a ticket for the Roy Thomson Hall showing, but you can use them for the second showing. Stand in the rush line at the theatre. If there are any ticket holders that don't show up or if they have extra seats that are not being used by festival guests, some of the people in the rush line may be allowed to purchase a ticket for the showing. As someone in the comments mentioned, you can go stand in front of Roy Thomson Hall by the red carpet to watch the celebrities arrive even if you couldn't get a ticket for the film. The same holds true of the other theatres as well, but there's no guarantee you'll see anyone. Last year, Viggo Mortensen did show up at the Ryerson for a showing of Alatriste, as did Sasha Baron Cohen for Borat. I saw Matthew Modine at the Elgin, Ed Harris at Isabel Bader, and Guillermo del Toro at another theatre. Individual tickets for the Gala films at Roy Thomson Hall and for the VISA Screening Room films at the Elgin are now on sale at the festival website. Note the main site seems fairly unresponsive right now, so you may have problems getting to the online order form. You can also call the festival at 416-968-FILM (local) or 1-877-968-FILM (toll free), or go in-person to the TIFFG Box Office at the Manulife Centre (Yonge and Bay), but I wouldn't expect either to be any less busy. Just a reminder that tomorrow, on Saturday, August 25th, at 10:00 AM, individual tickets for the galas at Roy Thomson Hall and movies at the VISA Screening Room at the Elgin go on sale. Starting August 28, you can also order from the Festival Box Office at College Park. Starting Septmber 5, you can also order from the WestJet TIFF Box Office at Roy Thomson Hall. There is a limit of four tickets, per screening, per person. If you really want to see a gala film at Roy Thomson Hall, you should try to purchase tickets as early as possible, as those films tend to sell out quickly. If you have a pass or one of the 10-film packages, you typically cannot select the gala showings at Roy Thomson Hall as part of the advanced ticketing process. However, each gala film has a second showing in one of the other festival theatres, which you can select for a pass or a package. You can select any of the VISA Screening Room showings with a pass or package. Greg in the comments noted that a TIFF press release started that Gala and VISA Screening Room tickets are $37.50 each if you buy them in advance. Note that regardless of how you buy tickets, you can pay by cash, debit, or Visa (Visa is the only credit card the festival accepts). Tuesday, August 28 marks the beginning of the advanced ticket selection for those who bought a Festival pass, a Daytime Pass, or a 10-Film Package (where films are not pre-selected by the festival). If you ordered any of these a while ago, you should have already received in the mail an Envelope voucher, a Drop Off voucher, and a Pick Up voucher. If you purchased a 2007 Programme Book, you should have also received a pick up voucher for that. Starting Tuesday, August 28 at 9:00 AM, you can go to the Festival Box Office at College Park, 444 Yonge Street, south entrance, Market Level. You must go to this specific box office only. Note that there is no advantage to arriving right at 9:00 AM, for reasons explained later in this post. When you go to the Festival Box Office, ensure you have your Envelope voucher (and your Programmer Book voucher if you have one of those). You exchange the voucher for an envelope and an Advanced Order Book. Note that it appears that the procedure has changed slightly from previous years, in that you may only get one envelope and form, as opposed to one per set of tickets. For example, I bought 3 10-film packages. Last year, I got 3 order forms and 3 envelopes; it appears that this year, I might only get one. Consult with the festival staff at the box office to ensure you get the correct number of forms based on this year's procedure. If you have a Programme Book voucher, you can also exchange it for the full-colour, comprehensive festival guide. Ensure that you also pick up a copy of the Official Film Schedule, as you will need this to complete your order. Once you have filled out the form, place it in the envelope you received when you picked up the form, and include your Drop Off voucher. Do not seal the envelope, and do not include any Pick Up vouchers; you need to keep those ones yourself for later. Take your completed forms back to the Festival Box Office and drop them off no later than 1:00 PM on Friday, August 31, to be eligible for the advanced ticket draw. Any orders received after this date and time will not be in the advanced ticket draw. You can drop off the forms any time from August 29 up to August 31 at 1:00 PM. The festival staff then spends the weekend processing orders. You can then line up at the Festival Box Office any time from Monday, September 3 at 10:00 AM onwards to pick up your completed forms and see what movies you received. Take your Pick Up vouchers with you to exchange for your processed order forms. For anyone who did not order advanced tickets, general ticketing opens to the public on Wednesday, September 5, online, by phone, and at all the box offices. At this point, all advanced orders have been processed and will be ready for pickup. In this example, if you were lucky enough to be in box #33, you would've gotten all your picks. But if you were in box #32, you probably won't get a lot of your picks. In that case, for each pick that wasn't fulfilled you typically receive a coupon which you can use to select a film from whatever still has tickets available. You can use these coupons any time during the duration of the festival. The bulk seemed to drop their forms off in the final three hours or so before the deadline. Last year, box 22 was randomly drawn as the starting point. I had forms in boxes 7 and 12, and there were three out of about 24 movies I didn't get. Note that this is just a list of the films; for most of the films there is no description of the film or a schedule of what times the film will be showing. For a description of the other films, your best bet at this point is the TIFFReviews.com site. The festival will post the full schedule and descriptions at the official TIFF site on August 28. Wednesday, August 22: The full schedule for the festival is available on the festival website, after 12:00 PM. You can also check out TIFF Reviews for more information about the announced films. Saturday, August 25: Gala and VISA Screening Room tickets go on-sale on the festival website and at the various box offices for the general public. If you didn't participate in the advanced ticketing process, this is your first opportunity to buy individual tickets. Tuesday, August 28: If you ordered a pass or coupons that require you to select films, the order forms are available starting on this date. Subsequent posts at this blog will explain the advanced ticketing process in more detail. Programme Books and printed festival schedules are also available. Friday, August 31: All advanced ticketing order forms must be turned in to the College Park box office by 1:00 PM. All forms received after that time will not be filled until advanced ticketing has been completed. The festival will notify you by e-mail what tickets you did and didn't get. Monday, September 3: You can pick up your advanced tickets, and choose replacements for any films you didn't get in the advanced draw. Wednesday, September 5: Tickets go on sale to the general public for all films. Thursday, September 6: The festival starts.